I’d been pretty conflicted ever since I’d finished The Raven King because as soon as I turned the last page, I didn’t know. I didn’t know what I thought. I wasn’t feeling that overbearing emotion that I feel with my five star reads, but I was feeling something. So, after some searching and rereading and reflecting, I’ve noticed. Do I love The Raven King? Yes, of course! Do I love it as much as The Dream Thieves? I didn’t know. But I do know that if I’ve would’ve loved this as much as The Dream Thieves, then I would’ve known as soon as I finished the book. Actual Rating 4.5 and yes, this is on my favorites 2016 shelf. 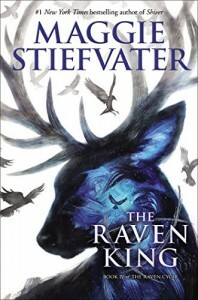 After three books of keeping up with Blue and her Raven Boys, I’m going to admit: I was trying to slow down and savor The Raven King as much as I could. I didn’t want the last book to end! Even now, I’m pretty much taking pictures of my favorite parts of this book and trying to see what I can do with my favorite quotes! Besides the fact that the characters are on point and this story is extremely enjoyable, I think we all should credit that Maggie Steifvater is an artist. I am not lying. Because I’m pretty sure only an artist can paint such vivid imaging in your head! Her writing styles is one of the most intricate and beautiful that I’ve read this year, and whenever I’d be reading, I’d stop by some sections to reread again. I did enjoy this book but I felt like there could’ve been more to the plot. The beginning was kind of slow but after, everything that happened was so climatic and happened so fast, it was pretty funny considering the pacing in the beginning. Did anyone else think that Glendower was dead? I had a feeling that he wasn’t actually asleep. HELL EFFING YES ADAM AND RONAN. YAS. YAASS. THEY’RE MA LIFE. Overall, I would definitely recommend The Raven Cycle to anyone who wants to try it out! It’s definitely one of the most creative and one of the best series that I’ve read! So honestly, do yourself a favor and just try out this series if you want to! I just wish there would’ve been a little more.